A musical 10 spotted by Ben Godfrey, Nottingham, on the display of his CD player. 1. The average British woman worries about the size and shape of her body every 15 minutes. 2. This Easter weekend will see 2.3 million people travelling through the UK's airports. 3. Six seats in the Italian Senate depend on the votes of Italians living abroad. 4. A flag expert is a vexillologist. 5. Coins which are called "coppers", such as the penny, have been made from steel since 1992. 6. Compensation payments to teachers following personal injuries, such as assaults by pupils, amounted to £7.6m last year. 7. Berlin's tallest building, a television tower, will have a giant 32 metre football placed on top for the World Cup. 8. Iceland has the highest concentration of broadband users in the world. 9. The suicide rate in the UK is at its lowest rate since records began in 1910. 10. Tony Blair is the first prime minister in recent times not to use RAF aircraft for family holidays. If you spot anything that should be included next week, use the form below to tell us about it. Has anyone noticed how much David Cameron looks and sounds like Ian Faith, manager of legendary rock band Spinal Tap? Could this be an exciting new direction for British politics? Is anyone else at work today? Thanks for today's Paper Monitor, it saved me going down the shops when I got out of bed at 1400hrs. Oh, I do love bank holidays! A service highlighting the riches of the daily press. What do people want to read on a sleepy bank holiday weekend? The Daily Telegraph seems to think that what we really want is something youthful, attractive and easy on the eye. Yes, the paper is full of fluffy animals. It's a trend that Paper Monitor has been observing on its early warning radar screens - but now the cute animal factor is in full blossom. The big picture on the front cover is of a young girl from a heart-warming heart-operation story holding up her perky pet puppy. And in case we were missing the point, there's a second dog picture on the front page promoting some giveaway or other. Inside, there's a lengthy tale about a man wanting to spot all 59 different species of British butterfly in a single year - complete with pictures of 10 different types of butterfly. And if you wanted something more international, then turn to the world news pages and what do you get? A strapping looking giraffe from Kenya. If the Daily Telegiraffe is going to the dogs, then there's plenty more animal antics elsewhere. Not to be outcuted, the Daily Mail goes for a story that combines drama with its bank holiday fluffiness. There's a picture of a newborn lamb that was dying until rescued by a couple of children who gave it mouth to mouth resuscitation. The only piece of uncomfortable grit in this particular tale is that the children have called the lamb "Minty." They couldn't could they? The Times takes a different tack. As a high-minded paper it needs a harsher perspective than fluffy spring lambs - so it goes in with a no-nonsense colour picture of a spider, with a story about smuggling and rare species. What we need is the acerbic, metropolitan angle of the Guardian, the espresso sharpness of their tough-minded analysis. Yes, most of the front cover is occupied by a picture of a big-eyed meerkat - plus a teaser to a second-section feature about a crow that lives near their office. Forget breaking news, it's barking news this weekend. On Thursday, the Daily Mini-Quiz asked readers to identify the luxury item that departing Desert Island Discs presenter Sue Lawley would take on her own desert island. The correct answer, a low golf handicap, was olny spotted by 11%, while 72% tuned into the wrong answer of a long wave radio. A further 17% picked the other wrong answer of a vanilla pod. Re the recent letters about ice cream van tunes. I recently heard one playing the theme tune to the film "The Good, The Bad and The Ugly". Clearly the van with no name. So you allowed only an hour to do the caption competition? I would have appreciated a phonecall. Some amusing captions, but how did they get the mealworms in the egg?? Is everyone else just clock-watching this afternoon, desperately waiting for 5 o'clock to arrive so that we can leave the hellish nightmare that is "work" for four days.....or is it just me? Not sure if it's worth me writing in as it's a Thursday but Janice from Coronation Street was singing the praises of porridge on This Morning this morning. Or yesterday morning depending on whether PM breaks tradition and actually publishes letters today. To those who need to know the size of the Dome, the O2 website informs us that should it ever be turned upside down, Niagara Falls would take about 15 minutes to fill it, it would take 3.8 billion pints of beer or 1100 Olympic-sized swimming pools; it equals thirteen Albert Halls, 10 St Paul's Cathedrals, two old Wembley Stadiums; 18,000 double-decker buses could fit into it; it's as high as Nelson's Column and could accommodate the Eiffel Tower lying on its side. This new law they've got that prevents us from celebrating/glorifying terroism. What happens on 5 November? Am I the only one to be amused by the article Mouse sheds light on regeneration which quotes Professor Ellen Heber-Katz? I'd like to read the first ever Magazine Monitor. Please provide a link. Thank You. Monitor writes: It's here, and dates from August 2004. How times have changed. Monitor says: Can't we just all concentrate on what we have in common? Persiflage, that would be. And work-avoidance. 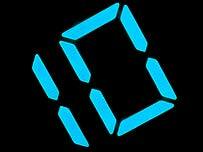 How many binary enthusiasts does it take to change a light bulb? 10 - one to hold the ladder, and one to change the bulb. Welcome to a special holiday edition of Speed Caption Competition. Rather than the usual 24 hours to craft an entry, we decided to give the caption comp a shake-up. So we gave you just an hour to send in a caption for the pair of meerkats trying to break into an Easter egg filled with meal worms as a treat for Easter at London Zoo. "Now tell me again about the first signs of bird flu..."
39, 42, hut hut hut. "How many times do I have to tell you not to do any decorating without my permission?" "But I wanted an Aero one..."
"God, I hate modern packaging." It's been a while since Paper Monitor turned its attention to old friend Bridget Jones. Her bump's coming along nicely, and her tangled love life is taking on a semblance of stability. But wait - there's something different about our Bridg. Is it the hair? No. The wine glass has been excised from her by-line photo. Yes, the Independent has discovered the joys of photoshopping (that is, "modifiying using Adobe® Photoshop® software"). The Daily Mail continues its campaign of intimidation with the front page splash: "How the pharmaceutical giants are making billions persuading us we've illnesses only their drugs can cure." Coincidentally, Herceptin - surely the only cancer drug known by name to the general public - is splashed all over the papers after a patient won her legal battle to get the NHS to fund her treatment. Such coverage has become a little disquieting since PM read the Guardian's excellent piece on just how the drug became a cause celebre last week. Meanwhile, PM is feeling a little deflated. As an avid reader of the Guardian's Corrections and Clarifications column, PM has had its fond hope that C&C reciprocates dashed. Having noticed yesterday that the paper mistakenly called John Prescott's wife Maureen instead of Pauline, PM expected a correction. Which has not materialised. Sob. Wednesday's Daily Mini-Quiz asked which song ISN'T on John Prescott's iPod? Only a few hair's breadth's between the answers - 33 percent correctly picked Simply The Best by Tina Turner, while 34 percent said Fairground by Simply Red and 33 percent said A Town Called Malice by The Jam. Another mini-question is on the Magazine index now. Well done to the RSPB man for cutting through the BS in describing the last hours of our avian Patient Zero - it "felt like crap, and landed and died before washing up in Cellardyke". Any chance we can persuade pharmaceutical manufacturers to employ Mr Farrar to write their labels and instruction sheets? I'm certain he could improve on the warnings that came with the medicine I just took which allude to "vague gastrointestinal symptoms", "chronic aesthenia" and "malaise". Of course "felt like crap" is a technical term - it comes between "felt a bit ropey" and "felt bloody awful" on the illness scale. I have noticed there are an unusual number of probe-related stories in the news today and have decided to show them here for everyone's childish enjoyment. On Monday, on this page we were told: "For the record, the BBC website disregards the term 'union flag' because of its 'great potential for confusion", preferring union jack (in lower case)'. On Tuesday on this page we were asked: "What does the Union Flag mean to you? Send us your Union Flag memories." What was that about confusion? Monitor note to Simpson: Can't we just all concentrate on what we have in common? Re: Light bulb jokes:How many bass guitarists does it take to change a lightbulb? None, the keyboard player can do it with his left hand. How many Magazine Monitor readers does it take to change a light bulb? One to change it, one to remark how it is the colour of porridge, one to make up an obscure term for when Magazine Monitor readers change light bulbs, three more to send in different words to use, one to link to an Magazine Monitor article on light bulb changing, one to comment that they once changed a light bulb but they don't expect that to be published, one to say that the Daily Express wrote an article on Di changing a light bulb and one to make a totally random comment which will no doubt spurn a new "-watch". How many Calgarians does it take to screw in a light bulb.? 10: 1 to change the bulb, the rest to sit around and reminisce about the Calgary Olympics. How many Magazine Monitors does it take to change a light bulb? One. Unless it's Thursday, in which case we'll change two tomorrow. How many Sudoku players does it take to change a light bulb? Not sure, but it's definitely two, four or seven. It's time for Punorama results. The rules are straightforward - we choose a story which has been in the news, and invite you to create an original punning headline for it. This week was Nelson. 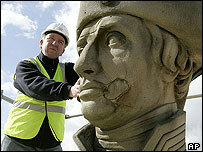 After 160 years standing on top of his column in Trafalgar Square, London, he is getting a facelift. He's in desperate need of some work after his face and arm were damaged in 1986. It was obvious but it was still good. Nelson dying words "kiss me hardy" prompted a flood of puns. Kiss me? Hardly! quips O.G. Nash in Doha, Qatar and Andrew Stone in Exeter. Greg Jobber in Melbourne, Australia, suggests Kiss me, Harpic and Kelly Evans from Reading offers Admiral efforts to make Nelson, Hardy. Now just substitute the word kiss for wash, clean, mend, fix, rinse and render sent in by Simon Rooke in Nottingham, Julie B in Ulverston, Nick W in London, Tony M in Petersfield, Richard Ryan in Kuala Lumpur, Malaysia and Jason Sweby in Plymouth respectively. You get the idea. Another famous Nelson quote proved inspiring for David Dee in Maputo, Mozambique and Ali M in Delft, who both came up with I see nose chips. The nautical theme was also a winner, with Stripped, shaped, and bristle fashioned from Bryn Roberts in Bristol, Swab the neck from Candace in New Jersey, US, and All the nice gulls love a sailor! from Mark Wrighton in London. Much jollity in the papers with the re-opening of Louis Tussaud's museum in Blackpool. The problem is that the wax just doesn't seem to work. ROO ARE YA? screams the Daily Star above a picture of an M&S mannequin who is supposed to have the famous Shrek-like features of Wayne Rooney. "ROO-BISH" it adds. ROO ARE YOU MEANT TO BE? asks the Daily Mirror, saying Rooney "could be anyone from the new 007 to Michael Owen". The paper claims Kylie's waxwork looks more like Jack Nicholson's Joker (the Star says it's the child catcher from Chitty Chitty Bang Bang), while it says Elton could be Aled Jones or Charles Kennedy. Paper Monitor, never one to criticise, asks all Monitor readers to spare a thought today for the hard-working waxwork artistes who probably don't feel quite so good today. Maybe they should draw some odd icons on their hands. Glad to report, however, that having read the Guardian, Paper Monitor now understands bird flu. Andre Farrar of the RSPB explains: "It looks like this is a whooper swan that spent the winter in Europe, set off on its migration, got halfway across the North Sea, felt like crap, and landed and died before washing up in Cellardyke." Presumably "felt like crap" is a technical term? Expect a correction in tomorrow's Guardian after it strangely said John Prescott's wife was called Maureen, when the humblest egg hurler knows she's called Pauline. But a closer look at the corrections column reveals: "The attempted shoe-bomber alluded to in the article headlined Your In-Flight Entertainment will not be... (page 3, G2, April 6) is Richard Reid, not Richard Reeves." Good job too, since Richard Reeves is a respected commentator and sometime Guardian contributor. At least he's not confused with Wayne Rooney. Tuesday's Daily Mini-Quiz asked what experts will be meeting at De Montfort University in Leicester to discuss next month? A rather unimpressive 35% of you correctly guessed it was England's obsession with beating Germany at football, while 46% wrongly thought it was the British obsession with talking about the weather and further 19% thought it was the British obsession with drinking tea. Does nobody else consider it to be a bit of a coincidence that Noel Edmonds' "cosmic-ordering" symbols are drawn in precisely the location on ones body where they are most clearly visible while one is holding a bakelite telephone to ones ear? Could it be a publicity stunt? Or perhaps the Cosmos is just an avid Deal or No Deal viewer and this is the simplest method for Noel to communicate with it. I know this is old news but I want to revive Natchwatch again. Last night I was watching the Simpsons and low and behold Otto (hippy bus driver dude) uttered the word natch.....I almost choked on my porridge. I found an interesting transcript from the Apollo 11 flight in 1969. Apparantly Buz Aldrin Likes Porridge. Start reading with the last sentance of Capcom's News Brief to the capsule crew. It is also rumoured that because of this conversation there is a crater on the moon named Corby. CAPCOM Roger.... National League baseball - was it yesterday - Thursday - St. Louis 11, Philadelphia 3; Montreal 5, over Pittsburgh 4; Atlanta 12, Cincinnati 2; San Franscisco 14, and Los Angeles 13. American League - we have Baltimore 3 over Cleveland 2, Detroit 4 to Washington 3, Minnesota 8, Chicago 5. Boston and New York was rained out. And in Corby, England, an Irishman, John Coyle, has won the world's porridge eating championship by consuming 23 bowls of instant oatmeal in a 10-minute time limit from a field of 35 other competitors. Over. SC Roger. Houston didn't play yesterday. SC I'd like to enter Aldrin in the oatmeal eating contest next time. CAPCOM Is he pretty good at that? SC He's doing his share up here. CAPCOM You all just finished your meal not long ago, didn't you? SC He's on his 19th bowl. I can't help thinking an opportunity was wasted when you chose the headline Seventh Planet Has a Blue Ring, although I suppose it avoided a lot of retaliatory e-mails. How could you miss the full-page article on porridge in the Express? Your article Generation Unplugged seems to be illustrated with a moulded plug that is designed not to be changed by the end-user. Whilst the "can you change a plug test" might make some over 50s feel smug, I'd like to see a similar test asking people to reinstall Windows, swap a CDROM drive for a DVD rewriter or set the timer on a video-recorder. Again on the Ten Ants sign, I go past a sign every day saying 'Cool Laying Fields', formerly 'School Playing Fields'. Oh the humour. Vicky in East London asks what Wal-Mart's bank might be called: how about Hole In The Walmart? I thought the weird signs on Noel Edmonds hands were stamped there by the studio bouncers so that he can get back in again. Inspired by Unplugged generation, and also we suspect by Green Light, you have been sending in light bulb jokes. Here are some. How many Vietnam vets does it take to screw in a light bulb? YOU DON'T KNOW! YOU WEREN'T THERE, MAN!!! YOU'LL NEVER KNOW!!!!! How many country and western singers does it take to change a light bulb? Two, one to do the job and another to write a song about how good the old one was. How many Oxford dons does it take to change a light bulb? None. Darkness will be the new industry standard! How many Man Utd fans does it take to change a light bulb? Three. One to change the bulb, one to buy the commemorative 2006 light-bulb changing football strip, and a third to drive the other two back to Torquay. None, they'll be moving out next term. How many guitarists does it take to change a light bulb? One, but then hundreds of others to tell them how Clapton, Hendrix, Page, Blackmore and so on could have done it better. How many men does it take to change a light bulb? One. He holds the bulb while the world revolves around him. How many altos does it take to change a light bulb? None - they all think it's too high. How many actors does it take to change a light bulb? Ten. One to change the light bulb, and nine to say, "That could have been ME up there!" How many Bristol students does it take to change a light bulb? None, Daddy buys them a new flat! How many software developers does it take to change a light bulb? Not applicable: it's a hardware problem. How many politicians does it take to change a light bulb? Two. One to hold the bulb and one to turn the room around. Submit more, if you must, in the usual fashion. The Daily Mail's on form today. "Is this the cure for hyperactive children?" "SLEEP - Are we all getting too MUCH?" "The snip-free vasectomy that's easy to reverse"
"What's lurking in your child's fizzy drinks?" "15 minutes to nail your bad back"
"Laser that can go round corners will transform surgery"
"KILLED BY A PIERCED LIP"
"Surgeons grew me a kneecap in a dish - now I can walk again". Paper Monitor's a bit dizzy after that catalogue of unconventional wisdom, undreamt-of fears, and miracle breakthroughs. The Daily Mirror tops the lot, though, with "THE PYJAMAS THAT COULD STOP MRSA". The Daily Telegraph, so often a calm voice amid the storm, has a remarkable picture on page three. It's a story about a man allegedly "buzzing" his neighbour's cottage with a helicopter. And the picture, sure enough, shows a cottage with a helicopter above it. But the helicopter is out of focus, not quite to scale, and - unaccountably - flying directly under power lines and even a phone line clearly going to the cottage. You might remember that yesterday, one of Paper Monitor's colleagues drew a nifty little symbol on his hand in an exercise of cosmic ordering, a la Noel Edmonds. Paper Monitor posited that perhaps he was ordering a different desk, away from the large pile of unread Metros. Well, bizarrely he had his wish come true before lunch: a new desk, away from Paper Monitor, and nearer the window. He was last heard saying "Deal!" Morrissey is number one in the album chart, so Monday's Daily Mini-Quiz - which can be found on the Magazine front page - asked how long it took for his UK tour to sell out? A reasonable 53% guessed correctly with 20 minutes, while 30% thought tickets were still available and 17% thought they had all gone in the first day. Maybe the avian bird flu coverage is making me too sensitive, but at first glance the picture accompanying the 'your green ideas' section in Magazine looked startlingly like a swan to me. Re: Formula Won; Nick Allen seems to have cracked it, although in his article he only discusses the case for walking up an up an up escalator. The formular does still also work, however, if you are hurrying up a down escalator - if you walk at twice the speed of the escalator, (ie p=2, e=-1) n becomes 2N, so you climb twice the number of steps, while ascending at the same rate as someone standing still on the upward escalator (p=0,e=1). And of course if you match your pace to the speed of the downward escalator (p=1,e=-1) n becomes infinite, as you remain motionless on your treadmill. However, if you walk up a down escalator at less than the speed of the escalator (p=0.5,e=-1) the formula tells us you'd experience -N steps, whereas logic tells us you'd experience concussion. In my youth the collective noun for Swans was "box", normally purchased with ten Players Weights. Re: Paper Monitor, Monday. I've written "PM" on my hand. I'll either become the Prime Minister or get this printed. I think the former is most likely. Students have been writing on their hands to "bag top grades" for ages. It's called "cheating". So, Walmart wants to extend its banking arm eh? Shall we save them the trouble of thinking of a smart sassy memorable name for this gripping new enterprise? Inside the Daily Express today is a poll asking whether the French authorities should answer these crucial questions about Diana's death. Can I ask everyone to get on the case and respond no. Maybe then they will shut up about it. I have just walked past an ice-cream van playing The Twelve Days of Christmas. Apparently, the UK has topped the binge drinking league. anyone fancy a celebratory pint? I've never had porridge before. This morning I had porridge with cinnamon and raisins. I was half-way through when I realised I had succumbed to the Monitor's porridge persuasion. A week after we last reported it, the Noel Edmonds/weird hand signs story reaches the Daily Star. "Wacky Brits are copying the telly presenter, 57, and drawing bizarre symbols on their hands to bring love, luck and happiness." It goes on: "[G]uys hoping to to pull a babe are using the technique when they hit bars and clubs, while love-hungry women are imagining their perfect man. It's even being used by university students to help them bag top grades." Strangely the Star is unable to quote anyone who is actually doing this, but we don't doubt for a minute that their story is based on real life (as opposed to the wishful cosmic thinking of a reporter who has to find something to write on page 15). Anyway got to be worth a go. Paper Monitor asks a work colleague to act as guinea pig by adding a strange symbol to his rather chubby hand. His cosmic requests obviously will remain secret (a different desk, perhaps?) but we will keep tabs on it. It being Monday, the front page story in the Daily Express is "DIANA: MAJOR BREAKTHROUGH... Relentless pressure from campaigners has forced French authorities to at last answer crucial questions about the death of Princess Diana." Humbly it doesn't name the relentless campaigners. But if you really want pictures on hands, like Noel, inside the Express are pictures of birds which some artist has painted on hands. They're amazing (though trying to look like a bird in the current climate is surely a touch reckless). And they're almost as amazing as some birds painted on hands in the Daily Mail. Yup. An identical collection. That's synchronicity for you. Maybe the artist had put in a cosmic request. In Friday's Pointless Poll we asked which new character should be introduced into the Mr Men series to bring it up to date. Little Miss Teenage Mum was selected by 42% of readers, followed by 30% wanting Mr Binge Drinker and 28% wanting a Mr Asbo.